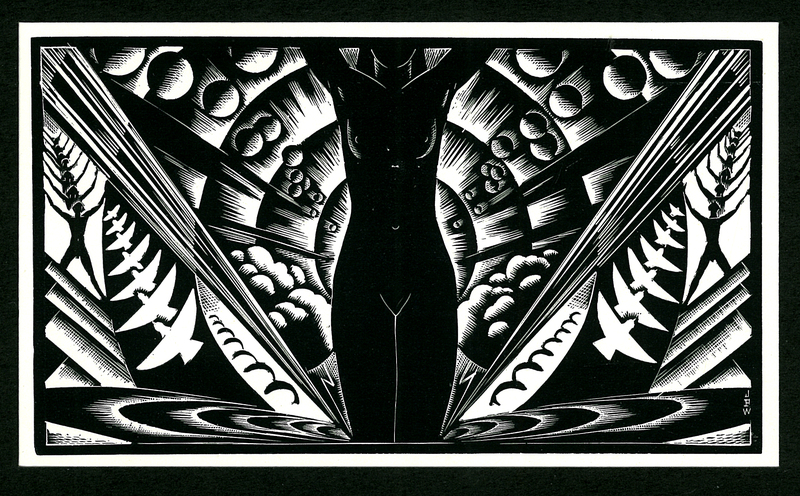 John Buckland Wright (JBW) was born in Dunedin in 1897. He left New Zealand in 1908 and eventually became one of the world’s best book engravers of the 1930s, 40s and 50s. Special Collections aims to amass a comprehensive collection of his works, especially in book-format. Although published in 1960, the 14 engravings made to illustrate Iwan Gilkin’s Le Sphinx actually antedate his first published work, The Collected Sonnets by John Keats (1930). Thus they are JBW’s first book-illustrations, and apart from two, were never previously published. This limited edition portfolio of 250 copies was purchased locally. Alexander A. M. Stols, “John Buckland Wright: Illustrator,” ourheritage.ac.nz | OUR Heritage, accessed April 22, 2019, http://otago.ourheritage.ac.nz/items/show/8307.